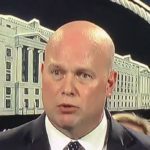 Back when Acting Attorney General Matt Whitaker was replaced by Attorney General William Barr a few weeks ago, it was announced that Whitaker had taken a new “senior counselor” job within the Department of Justice. Palmer Report pointed out at the time that this new gig was clearly an attempt at keeping Whitaker from cutting a plea deal against Donald Trump. Now, remarkably, Whitaker has quit the new job already. So what’s going on? We can rule out the possibility that Matt Whitaker is bailing on the DOJ because he’s landed some better job, as NBC News reports that he’s now seeking out a new job. So we’re left with the reality that Donald Trump handed a cushy DOJ job a few weeks ago, and now Whitaker is quitting that job, ostensibly choosing to be unemployed instead. There are only a couple plausible explanations here. The House Judiciary Committee has made clear that it’s actively pursuing Matt Whitaker for perjury, from when he testified a few weeks back. That’s a felony, and Whitaker can go to prison for it. But really, the committee would rather get Whitaker to cooperate against Donald Trump, than to lock Whitaker up. So even as House Democrats are trying to use the implied threat of felony charges to push Matt Whitaker into flipping on Donald Trump, suddenly Whitaker has bailed on the job that Trump gave him in the hope of getting him not to flip. It sounds like either Whitaker bailed on the job because he has flipped, or Trump pushed him out of the job because he suspects Whitaker has flipped. Stay tuned; this story is just getting started.